Now that I have shared with you a recipe for homemade Vanilla Marshmallows, I want to take it one step further for the "ultimate" s'more experience. 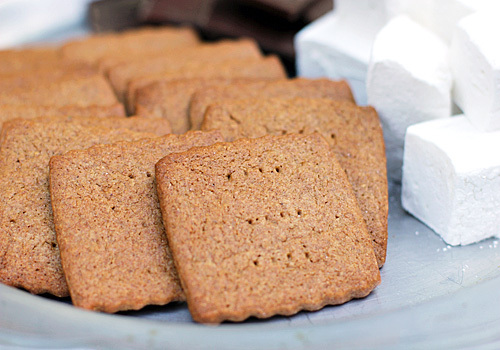 These homemade graham crackers will provide an edible foundation that you will not soon forget. This is a whole wheat dough sweetened with sugar, honey, and molasses for a nice depth of flavor. The cinnamon adds a gentle spice note. The original recipe called for whole wheat and light rye flour, but I used all whole wheat. I thought the full nutty flavor would work well with the honey and molasses, and it does. I also added a touch more vanilla to the dough. Unlike a cookie where you need to cream the butter and sugar, this recipe is more like making a pie crust. Process all the ingredients in the food processor just until the dough comes together. Then chill, roll, and cut your way to gourmet grahams. Don't just make these for s'mores, though. They are great to pack in school lunches, delicious when slathered with peanut butter or Nutella for an after school treat, or perfect for a not-to-sweet afternoon pick me up. Whether you make them for s'mores or snacks, you and whoever else eats them will be happy you did. 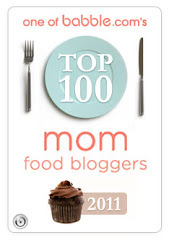 In a food processor, mix together the flours, sugar, baking powder, baking soda, salt, and cinnamon. Add the cold butter and process until the mixture resembles coarse meal, about 30 seconds or so. Add the honey, molasses, water, and vanilla. Mix until the dough starts to come together in a ball, about another 30 seconds. Transfer the dough to a sheet of plastic wrap. Using the plastic wrap and the back of your hands, press the dough into a square. Wrap tightly in the plastic wrap and chill for at least 30 minutes. Unwrap the dough and place it between two sheets of lightly floured parchment paper. Roll the dough 1/2-1/4 inch thick. Transfer the dough to a baking sheet and chill for at least 1 hour, or until firm. Preheat oven to 350º F. Retrieve the dough from the refrigerator and roll it to 1/8-inch thick. With a sharp knife, pizza cutter, or fluted pastry wheel, cut into 2-inch squares. (If the dough is to warm to work with, you may want to set it in the refrigerator to chill before transferring the dough to the baking sheet.) Arrange the crackers on parchment lined baking sheets. Using a fork, prick each square three times. Bake for 15 minutes until lightly browned at the edges. Remove from the oven and let cool on the pan. Enjoy! I've been hunting for a homemade graham cracker for some time, so this came at a wonderful time! Just wondering if they keep well though? These crackers do keep very well and stay nice and crisp. Although they don't last long in our house especially during "s'more season", they can be stored in an airtight container at room temperature for up to a week. I have also made the whole batch of dough, bake half of it, and freeze the remaining dough for another time when I am need of freshly baked graham crackers. Thaw the dough in the refrigerator before proceeding with the recipe. NO graham crackers in Australia. You're a godsend! Thanks! I too was looking for a graham cracker recipe, but am surprised there is no graham flour in it (such a thing exists, doesn't it? -- now I'm questioning myself). I'll give these a try. Thanks for sharing. I'll search for you vanilla marshmallows too! Graham flour is a wheat flour that is less processed than whole wheat flour. It does exist can be found, but not a easily as whole wheat.